This chocolate chip cookie dough has two secrets to success. The first is the addition of cornstarch, which holds in moisture to guarantee a soft-centred cookie. Up to two tablespoons (2 Tbsp) of cornstarch can be added to this recipe, to ensure a softer center and tender texture to the cookie. The second is to chill the cookies before baking – this ensures they all bake to the same size and don’t spread too much while baking. 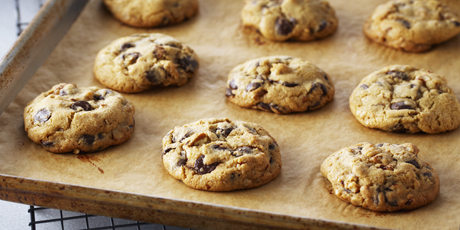 You might also like the Most Popular Cookie Recipes Of All Time. 1. Cream the butter with the brown sugar and granulated sugar together well. Beat in the egg and the vanilla. 2. In a separate bowl, sift the flour with the cornstarch, baking soda and salt. Add this to the butter mixture and stir until blended. Stir in the chocolate chips and pecans (if using). 3. Using a small ice cream scoop or a tablespoon, scoop spoonfuls of dough (about 2 Tbsp) shape them into a ball and place onto a parchment lined baking tray or a plate. Chill the scooped cookies for at least an hour, or once chilled, the cookies can be frozen for baking later. 4. Preheat the oven to 325ºF. Arrange the chilled scooped cookies onto parchment-lined baking trays, leaving 3 inches between the cookies. Bake for 15-18 minutes, until browned around the edges. Cool the cookies on the baking tray. If baking cookie dough that has been frozen, arrange the frozen cookies on the baking tray and let them thaw for 20 minutes at room temperature before baking as above.